I crave food from the Middle East. The bright colors and flavors, the uninhibited use of spices, the freshness of the cuisine. If I had to compile a list of my favorite comfort foods, it would include many dishes from this part of the world. I have been lucky during my career to work for some great chefs. If you asked me which chef that I worked for during my career that had the greatest impact on my life, I’d tell you Chef Sharon Hage, who was of Lebanese desent. Although I had eaten Greek and Lebanese food many times, and was familiar with many of the dishes, Sharon was the first one to teach me how to prepare them. Cooking and more importantly, flavor doesn’t know boundaries. I worked with Sharon in Dallas, Texas and we were cooking food that was “Southwestern” at that time, however she taught me how to employ ways to give food a punch of flavor that were indicitive of Middle Eastern cooking, particularly the use of fresh citrus juice to create a balance of flavor in a dish, something that I use to this day nearly every time I set foot in a kitchen. I also was also fortunate to work with a chef from Syria, Tim Soufan, who also added to my repetoire of Middle Eastern knowledge. He used to enjoy taking me to Middle Eastern markets, and taught me about ingredients that were indicitave of the cuisine of his homeland. A few years ago, I had the opportunity to go to Dearborn, Michigan to do some work for several months. Dearborn has the largest proportion of Arab Americans in The United States. I quickly made friends with one of my co-workers, a Lebanese-American, Bernard Issa, who upon learning of my affinity for Lebanese food, enjoyed nothing more than introducing me to fantastic restaurants in the area. It was during this time that I really began to crave the food for the comfort that it brought me. I’ve been eating at Sahara as long as I’ve been living in Sarasota. It is a very inexpensive lunch spot, and I’ve never, ever been dissapointed. Yesterday, I had a food itch that needed to be scratched, so I picked Sahara for my lunch. When I place my order, I always get a side order of dolmas from the cold case to eat while I’m waiting for my lunch. Dolmas are grape leaves that have been stuffed with rice, and seasoned with typically dill and lemon. They are always a treat, and a great way to start the meal. I ordered a falafel and hummus wrap for my main course. For those of you that aren’t familiar with falafel, it is a common street food throughout the Middle East. It is a ground mixture of either chick peas or fava beans, seasoned with green onion, garlic, parsley, cumin, coriander and lemon juice. It is shaped into balls, or patties and fried. When I eat food with so much flavor, there are times that I have to admit, that I could actually see myself living a vegetarian lifestyle. I didn’t indulge yesterday, but I’ll typically also grab a piece of Baklava to take with me to savor once I’ve digested the rest of my meal and created some room. 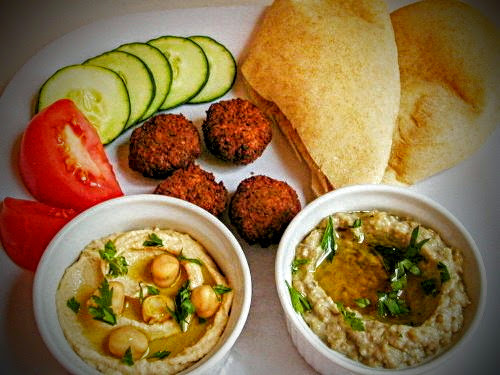 Sahara is a fun lunch alternative…inexpensive, delicious and fast!